Every woman gets her own share of mood swings. Blame it on the hormones, the job, the motherhood tasks, the worrying about anything and everything. Sometimes I feel that I really do not have enough "me time" and it gets the best of me. Last Christmas, my office mate Mischy gave me a gift which I really needed. She must have read my mind. She gave me a small paper box containing little cards with suggestions on how to enjoy your "personal time." Each little card provides valuable advice on how to de-stress, relax and just enjoy the moment. This little box has helped me through my "blah" days. Those days when you feel worthless, run down, ugly, angry, sad, depressed, - those days that have been patented for women. 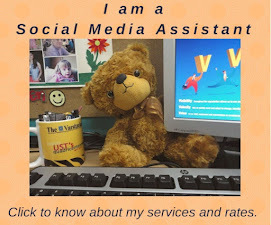 Blogging has helped me a lot. Writing has made me become aware of the sentiments of others. It has helped me find humor in daily mundane activities. Even if I do not blog everyday, I make it a point to take note of things around me - events, experiences, changes. I would say I wait for that "push." It is my heart that drives me to turn my thoughts into words. I need to feel it to write it. My mother always had flowering plants in and around the house. She has a beautiful collection of orchids which she religiously "talks to" everyday. She buys the best kind of plant food for them to keep them always in bloom. I guess I got my green thumb from her. I am more of the practical side though. Instead of planting flowers, I raise vegetables in flower pots. My latest crops are cherry tomatoes and all sorts of peppers. I tend to them every aftenoon, watering them and loosening up the soil to aerate the roots. I wish to see them bear their first fruit. My next project would be an herb planter.. or maybe I could try mushroom farming. It has been a while since I visited the schools I attended. All of them were Catholic schools, and growing up with nuns and priests taught me about not giving up in the face of adversity and the power of prayer. My love for family has its roots in the teaching of the Catholic faith and I will be forever grateful to my parents who spent a fortune on my education. 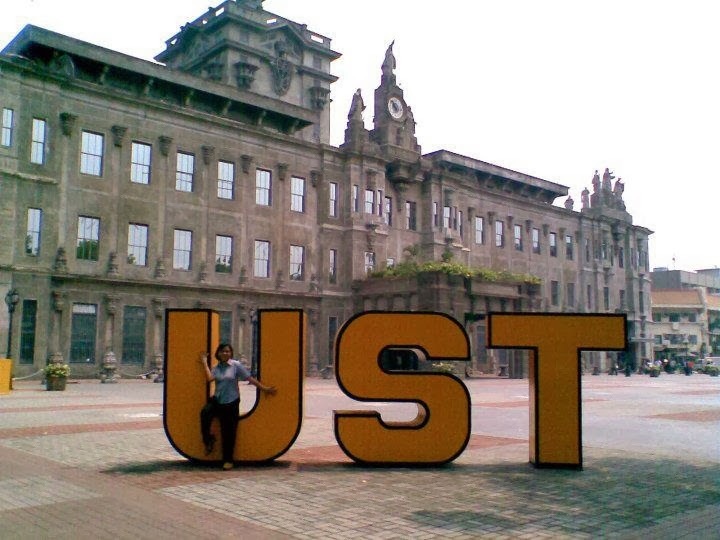 The last time I went to my Alma Mater, the University of Santo Tomas, was 3 years ago, when I took my son to enroll him for his freshman year. I did notice that so many things have changed. There were new buildings, a monstrous gymnasium, the Plaza Mayor, a student center, etc. Even student attendance is monitored by swiping an ID in the building entrance. We used to deal with a class roll call when I was a student. Now I feel so jurassic. The Main Building of the University of Santo Tomas. This is where I earned my degree in Zoology. Wake up call for me. I have to keep in mind that someone somewhere is having a worse day than me. Somebody has nothing to eat, or no roof over their head. I must be thankful of what I have. Although I did not follow the instructions on the card by writing names on a piece of paper, I always keep these people in mind and mention them in my prayers. In the next few days, I may be writing their names on pieces of paper and stick them in the part of the house where I am always at - in the kitchen and laundry! To keep our sanity, we need some quiet time all to themselves. Time to just curl up in bed with a good book, to sit with her feet up on the sofa. Time to explore the world outside the kitchen and the laundry. Time to be with childhood friends, to try a new hairstyle, to watch the sunset. Indulge in a few minutes of quiet time, to listen to our innermost thoughts and to allow God to speak to us. The only way we can effectively give love is to start loving ourselves too. Take a few minutes off your daily routine. Bask in that much needed "Personal Time." Thanks for your post. I promise to give myself some personal time! God bless! That "me" time is ultimately essential for us not to lose our own selves in the throng. We have to keep that rare individuality going. What with the stress that we have to hurdle everyday, if we can't contain it, we might just explode anytime, Yes! Like a time bomb! Hahaha! Seriously, this post is inspiring and timely too. It is such a good reminder that giving ourselves some time alone is loving ourselves and giving it inner peace that it rightfully deserves. That is one interesting book. It certainly piqued my interest. It's even more special because it was given as a gift to you. You must be one special gem! Cheers and may you be more blessed! I like this "Personal Time" box. Reading the cards you chose makes me reflects about my life, too. I would definitely buy one for myself and maybe a couple of my friends who I know will love this. Can relate the "blah..blah..days" and maybe we should get acquainted with the new generation by heart. We made our lives in another generation, but thinking of the future still the same as ever. The difference is, we have an offspring to guide on through the years, our motivation to grow more each day. that's a great way to have i bet, something that would at least help us to remember what we should need to do in order to be calm. Gardening calms me down and that's something I truly miss during Winter times. Your pepper plants looks very healthy. Personal time is very important, My husband always give me some personal time even taking care our daughter.We do weekend getaways and that's my personal time considering hubby would taking care our daughter once we are out. I like that line, and I agree why do we women have those days that are just inherent to us? I'm not a mom myself but just like you, I have those blah days too. I love "me" time, something we should all not forget, thanks for all these reminders Ai, I am a very sentimental person, and one of the things I love doing is walking down memory lane, I always try to visit precious places that brought precious memories from my younger years. that's so nice of her. I would love to set time and pamper myself. Someday! Those cards are really helpful and love all the messages on each card. I read when I need my "me" time or turn on the radio and dance. That personal time is precious so to speak, but make it a total satisfaction time. That is a nice gift to receive! I also got a similar box from a friend but it was a beauty box with homemade recipes to put on the face. I have not tried one tip though. That is a nice gift. Try also to read Bible and give yourself a 15 minutes prayer time, im telling you, it helps. Denmark, that is something that I have and must invest time to. I haven't done that in years. my personal time is sleeping LOL! But the most beautiful to spend our time is with God. I don't have many blah days... what I do have are days with way too much to do. I need time to chill and do nothing. Love this post.